Next week we are going to my favorite location for a little outdoor sketching. Hey Matt, good question, what you see there is not exactly a grid, because that would not be very helpful for outdoor sketching(while this was done from a photo I was using the same approach I use for sketching "from life") I do not use vanishing points very often in freehand sketches, instead what you are seeing here is what I call squared measurement. 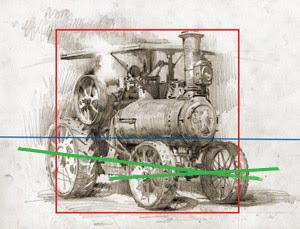 Essentially I find an area that is perfectly square (seen in red in the new image on my blog) and then I use this to judge any further measurements and or perspective angles angles and slopes. In blue you see the horizon line which helps me judge point of view and perspective (above the horizon looking up, below looking down) One last note, with something this mechanical I will typically look for a major and minor axis to help me in establishing a crude perspective grid, seen here in green. Ok Erik I got a question, I was going to ask in class, but maybe its informative enough to be up here so other people can read it. The only hint of set up lines in this sketch is the slight grid you made. Did you use any perspective lines when you did this sketch? If I were to have sketched it I would have just found my 2 VPs and wouldn't have used a grid (assuming those lines were a grid). Did you use the assumed grid to be more accurate similar to a master study? Also you should add a zombie underneath that back tire. That would make a cool idea, Zombies and Steam Tractors. dude thats a dope sketch!